Sponsors: Dartmouth College, MSNBC, New England Cable News, the Democratic National Committee, and the New Hampshire Democratic Party. Candidates: Sen. Joe Biden, Sen. Hillary Clinton, Sen. Chris Dodd, former Sen. John Edwards, former Sen. Mike Gravel, Rep. Dennis Kucinich, and Gov. Bill Richardson participated. [all 8 of the candidates]. Moderator: Tim Russert, NBC News Washington bureau chief and host of "Meet The Press" and questions from NECN political reporter Alison King. Audience: About 725 audience members; tickets allocated between the partners (Dartmouth, NBC/NECN, and the New Hampshire Dems/DNC) roughly by thirds. Broadcast: Live on MSNBC, New England Cable News and New Hampshire Public Radio and streamed live over the web on MSNBC.com and NBC News 2 Go. Also broadcast on Telemundo. Format: Two hours; three ad breaks. 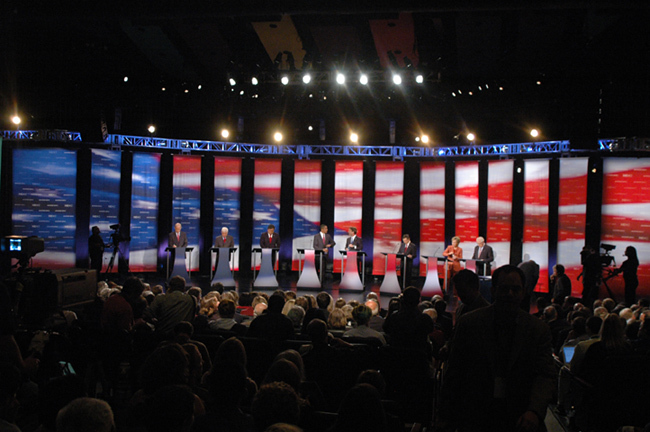 Background: The third DNC-sanctioned debate and the second Democratic debate in New Hampshire. Additional Notes: The Dodd campaign's "Talk Clock" showed that the frontrunners were accorded more time: Clinton 17:37; Obama 13:30; Edwards 12:17; Richardson 11:49; Dodd 9:33; Biden 7:01; Kucinich 7:00; Gravel 4:20. One of the subtexts of this debate was that an increasing number of observers were starting to see Clinton as looking more and more like the inevitable nominee.